Calvino's is an anchor of Cricket West shopping center. At over 20 years old, we've amassed a loyal clientele of neighborhood locals, college students, and restaurant lovers alike. 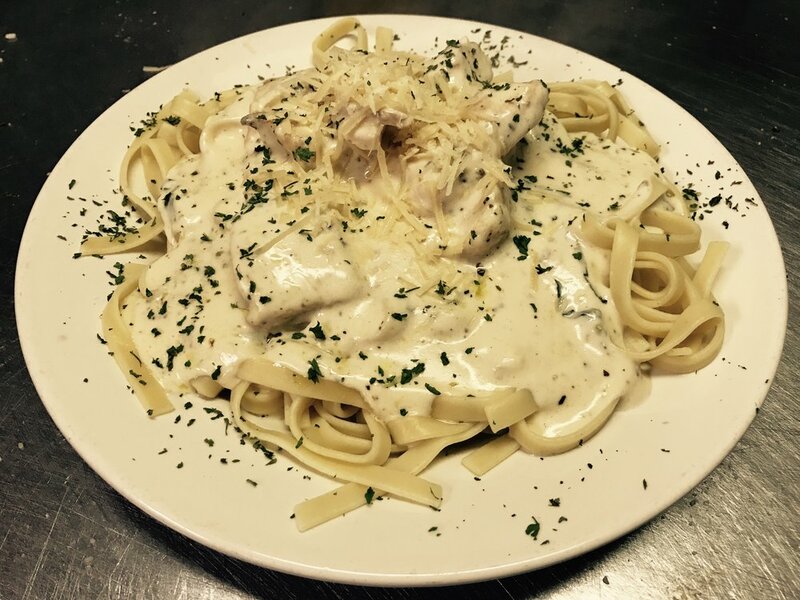 If you've never been to Calvino's, change that today! Fridays from 5pm-7pm, we host a happy hour at our bar only! $5 house pours along with an appetizer menu to kickstart your evening. we better see you there! Eat, drink, and be happy! Every month we host a reservation only wine tasting, usually on a Saturday, from 3-5pm. However, it is possible sometimes that it will be held during the week, though not especially likely. We typically offer 6-7 wines & gourmet appetizers that are kept secret until the time of serving. We appreciate notice if a party has an unforeseen circumstance that results in you not attending. We love doing monthly wine tastings and sharing fun food/wine pairings with you. We thank you for your loyalty and will continue to hold events such as these. For information regarding dates, wines, and reservations, call our store and inquire further. We love to be able to accommodate as many customers as possible. With limited seating and a lot of traffic, our dinner service can get busy. We ask that if you're bringing a party to dine with us, whether it be 2 people or 12 people, that you make a reservation for seating if you aren't prepared to wait. Reservations the day of can be made within reason but we appreciate a 24 hour notice. Parties larger than 13 people are asked to reserve our private lounge. *Poetry Readings every second Sunday of the month from 6pm-9pm. Subject to change for holidays or inclement weather. Step into the Calvino's wineshop today and make a new best friend in one of our wide selections of retail wine! If you know what you're looking for, we have many of the usual suspects. If you need guidance in picking something you're unsure about, don't hesitate to ask us, we love turning people on to new and exciting wines! If there is something missing from our shelves you would like to have, run it by us and we will do our best to order some for you as soon as possible. If there's something you love and two bottles just isn't enough, let us know and we will make sure there are more here for you on your next visit. We offer a discount on cases of 12 bottles. How could we talk about wine and not mention food? Well, wine pairs excellently with our foods, and who would we be if we didn't offer all of the amazing wines we have at retail for dine-in service as well? We charge a very modest $7 corking fee to open any bottle from our shelves and drink it while you dine. A corking fee is a charge added to a bottle of wine purchased at retail minimum from our shelves and then opened while dining. Uncorked more than you can drink? No worries! We are able to allow our customers to cork and legally take home any unfinished bottles of wine. If you have any further questions, do not hesitate to call our store and inquire. Eat, drink, and be happy! 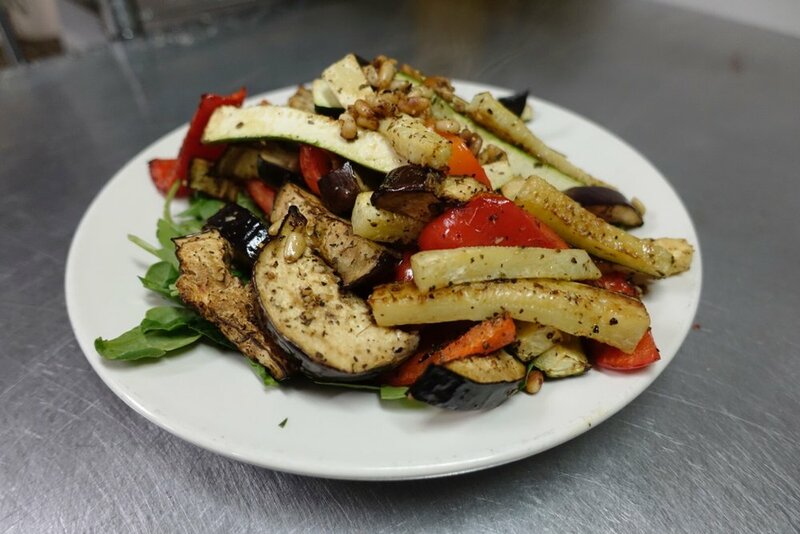 Warm salad with zucchini, red peppers, eggplant and pine nuts with our house dressing, served on a bed of spinach. Add salad Toppings: Sm. $1.50 Lg. $2.00, Chicken: Sm. $1.95 Lg. $2.80, Gyro: Sm. $1.99 Lg. $3.99, Anchovies: Sm. $2.60 Lg. $3.25, or Shrimp: Sm. $3.25 Lg. $4.25 to any salad. Ranch, Light Ranch, Italian, Light Italian, Greek, Herbal House, Bleu Cheese, Honey French, Caesar, Honey Mustard, Thousand Island, and Balsamic Vinaigrette. Pizzas come in 8"(small) 12"(medium) 14"(large) and 16"(super) sizes with 6,8,10,or 12 slices respectively. Pepperoni, bacon, sausage, ham and ground beef. 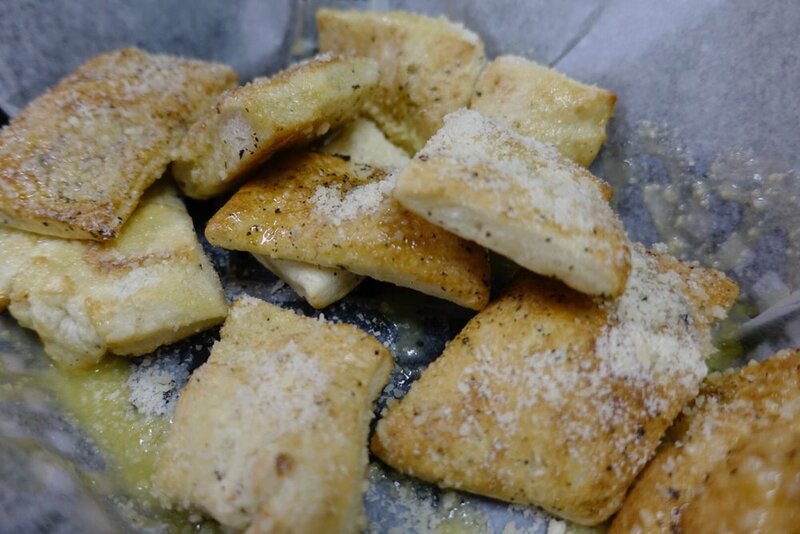 All Bolis are topped with butter and parmesan, excluding The Club, which is topped with cajun and parmesan. Bolis are served with pizza sauce on the side, excluding, The Club, which is served with ranch dressing on the side. Bolis come in 6"(mini) 11"(original) 26"(super) sizes. Served in red or olive oil sauce. No half orders. Choose Marinara, Olive Oil and Garlic, Alfredo, Pesto, Creamy Tomato, or plain/plain with butter, or half of two sauces. We love to cater events! If you have somethingon the calendar and want some of the delicious handmade foods ofCalvino's, give us at least 24 hours notice, but make your reservations as soon as possible. We'll work out a menu and price for your event. 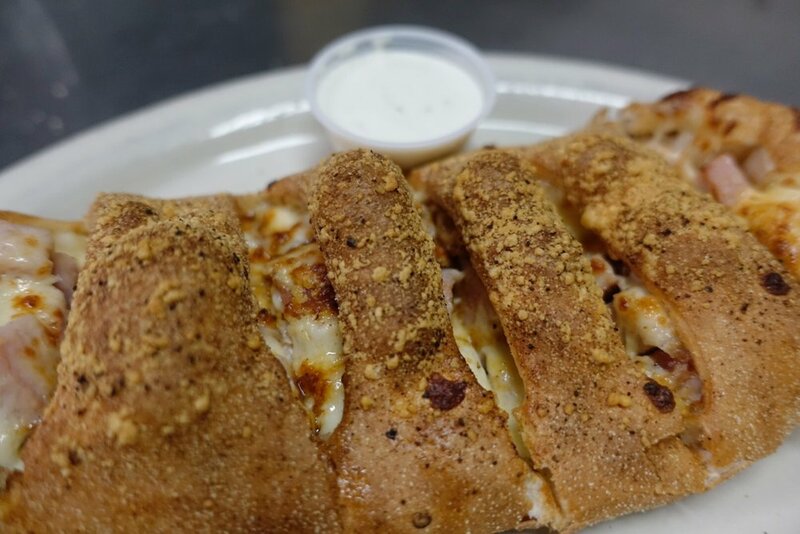 We offer buffet style salads, penne pasta, pizzas, and strombolis. Call our store: (419) 531-5100 for pricing and suggestions for your event. Reserve our upstairs lounge! Its perfect for your dinner rehearsal, wedding reception, graduation, or any gathering of those who want great food. Room can be customized for seating of 40 people Maximum. With a bar, banquet tables, and a private server, this is the space for your event. Attendees may bring their own decor to fully customize the space, come in before the event, and setup. Call our store: (419) 531-5100 to inquire about dates, catering style meals, design/decor, or made to order menu items for your event.